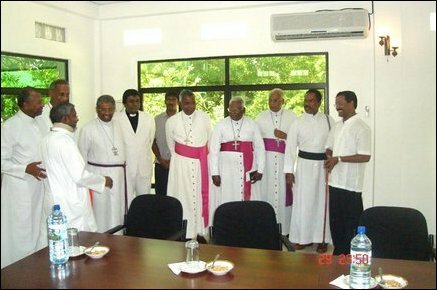 Bishops and Senior Clergymen from different districts across Sri Lanka met with the Liberation Tigers leadership in Kilinochchi Peace Secretariat at 11.45 a.m. Friday. Discussions focussed on exploring ways to return normalcy to the NorthEast which has witnessed increasing levels of violence in the last few weeks, sources in Kilinochchi said. Prelates expressed their deep desire that peace return to NorthEast. "We told the prelates the how the Government of Sri Lanka's refusal to comply with the provisions of the CFA, has affected the lives of the people who have been displaced from the High Security Zones for more than a decade. People are frustrated and dejected by the inaction of the Government during the last three years of peace in bringing normalcy to NorthEast," Thamilchelvan said talking to the press after the meeting with the Clergymen. "Peoples' anger will subside only when rights violations, harassment and unprovoked attacks by the Security Forces on civilians stop. If the Church takes constructive efforts to communicate to the SLA on the futility of their recents acts of violence, we will provide our full co-operation to these efforts," Thamilchelvan further said he told the priests. The Bishops expressed regret for not condemning promptly the killing of TNA parliamentarian during the Christmas Mass, and agreed that the killing was a gross rights violation, Thamilchelvan said. On the issue of venue of Peace Talks, Thamilchelvan said that as the host country of facilitators, Norway is the most appropriate venue for starting talks. Sri Lanka Government made the venue an issue and since then vacillating between Japan, Asian country and even South Africa with the intention of preventing our movement gaining legitimacy in Europe. Our prelates also agreed that if the Sri Lanka Government is fully committed to advancing peace they should not attempt to place restrictions on the venue, Thamilchelvan told thepress. Deputy Head of LTTE Political Wing, S Thangan, Director of LTTE Peace Secretariat, Puleedevan, Deputy Head of LTTE women's political division, Ms. P. Geetha, and LTTE Liasion officer for Human Rights NGOs, Mr Thiagarajah participated with Thamilchelvan in the meeting. The delegation of catholic priests comprised, Bishop Thomas Soundaranayagam (Jaffna), Bishop Rayappu Joseph (Mannar), Rev. Jeyakumar (Hudec, Jaffna), Rev. Kadirgamar (Methodist Church), Rev. S.P. Nesakumar (Archdeacon of Jaffna) and Bishop Viani Fernando (Kandy), Bishop Duleep de Chikera (Colombo) and Bishop Kumara Illangasinghe (Kurunagala), Rev. Ebenezar Joseph (Methodist Church) and Rev. Jeyasiri Peiris (National Christian Council).